In the northwest Indian Ocean near the Gulf of Aden, is 250 km long and comprises four islands and two rocky islets which appear as a prolongation of the Horn of Africa. 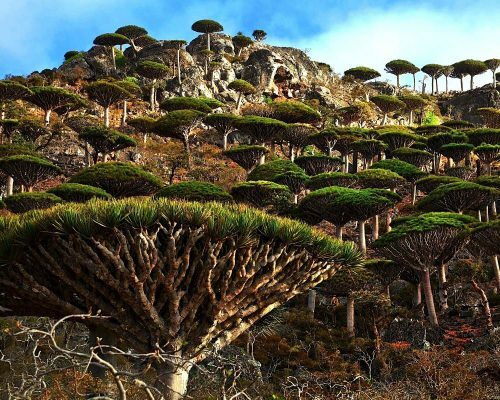 The site is of universal importance because of its biodiversity with rich and distinct flora and fauna: 37% of Socotra’s 825 plant species, 90% of its reptile species and 95% of its land snail species do not occur anywhere else in the world. The site also supports globally significant populations of land and sea birds (192 bird species, 44 of which breed on the islands while 85 are regular migrants), including a number of threatened species. The marine life of Socotra is also very diverse, with 253 species of reef-building corals, 730 species of coastal fish and 300 species of crab, lobster and shrimp. Socotra has high importance for bird species as underlined by the identification by Birdlife International of 22 Important Bird Areas on Socotra. Socotra also supports globally significant populations of other land and sea birds, including a number of threatened species. Extremely high levels of endemism occur in Socotra’s reptiles (34 species, 90% endemism) and land snails (96 species, 95% endemism). The marine life of Socotra is also very diverse, with 253 species of reef-building corals, 730 species of coastal fish and 300 species of crab, lobster and shrimp, and well represented in the property’s marine areas. The city is a marvel of mud-brick skyscrapers, densely packed together on a small mound, and which extend upward some five to eight storeys. Since 1982, te city has been recognized as a World Heritage Site by UNESCO. The historian Al –Hamdani writes that the Sabaean king Sha’r Awtar built the city wall and the amous Ghumdan Palace. 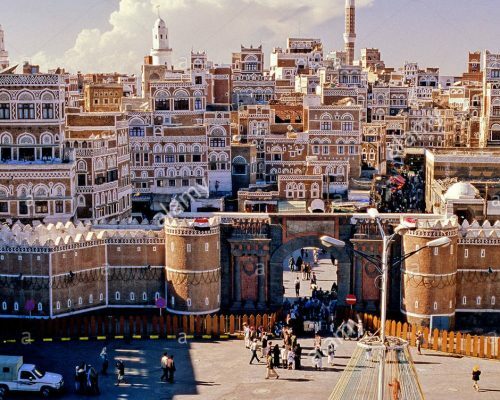 It is said that Sana’a was also once know as Azal; Yemeni genealogists relate this to the name of Uzal, the sixth son of Joktan (Arabic Qahtan), great-great grandson of Shem mentioned in Genesis 10:27. 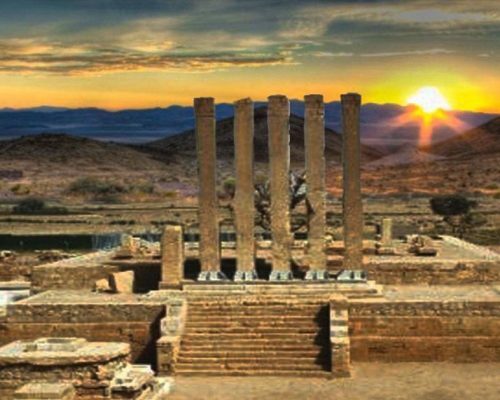 The great temple of Marib, the Awwam (sometimes called Mahram Bilqis) is dedicated to the moon god Almaqah. It was partly excavated by Wendell Phillips' expedition of 1951-2. A series of monolithic pillars, probably the propylaeum, mark the entrance to the temple, which may have been used as a sanctuary. The finest sculpture of the ancient Arabs, a figurative bronze of a Sabaean nobleman Ma'adi Karib (of probably the seventh or eighth century BC) was originally found here. It is now in the National Museum. Arsh Bilqis – the Throne of Bilqis – is the second most important temple in Marib. A line of five elegant symmetrical pillars, also known as the Almaqah or Moon Temple, was built towards the end of the eighth century BC. This has now been extensively excavated, uncovering a broad temple floor surrounded by steps and inscribed marble plinths. It has a pure abstraction and geometrisation that can be seen in Yemeni structures even Today. Originally it was a fort, then after many modifications it became the official residence for Sultan Al Kathiri. The palace dates back in its present state to the late 16th century. 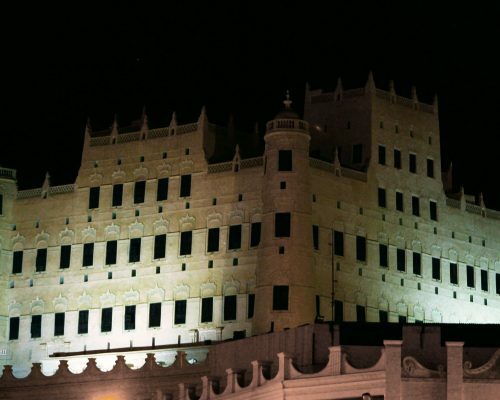 It consists of 16 buildings, is 34m high and has 90 rooms. Part of it is now used as an archeological museum of traditions and customs as well as a public Library. Al Kathiri tribe lives in several regions in Yemen, Oman, the United Arab Emirates, Saudi Arabia and Qatar. However, they mainly populate Hadramout and Mahara provinces in Yemen, and the province of Dhofar in Oman. They also have presence in Southeast Asia and East Africa.